Hamlet. Angada. One an immortal character from the tragedies of William Shakespeare, and another from Valmiki’s Ramayana. Hamlet sought revenge upon his uncle Claudius, but Angada, son of Vali, was a loyal nephew to Sugriva. Imagine both characters on the same stage, conversing about their experiences. The essence of the characters does not change, even though the plot does. 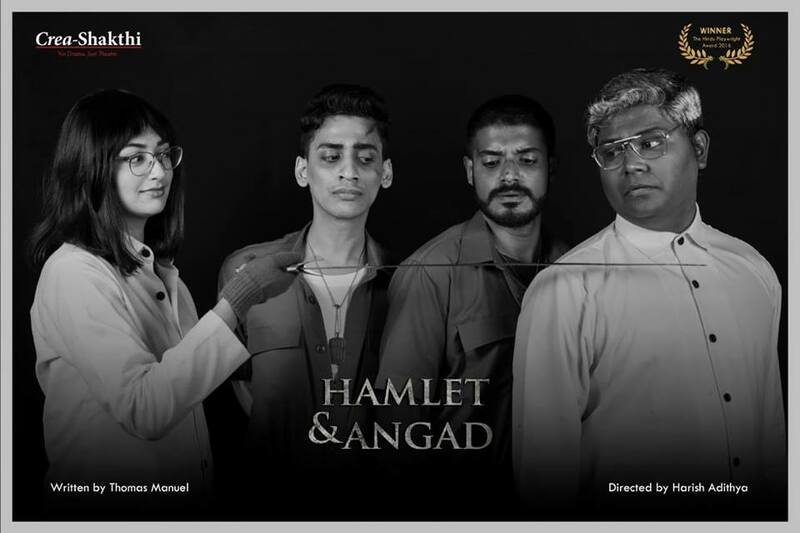 The play Hamlet & Angad, scripted by Thomas Manuel and produced by the group Crea-Shakthi, epitomises the changing times in Chennai’s theatre setting. Mythology has been used in theatre since time immemorial. Epics such as Ramayana and Mahabharata, and historical novels like Ponniyin Selvan, still find space in Tamil theatre. “Kalki Krishnamurthy’s novels are as famous as ‘The Lord of the Rings’. Even today, they are enacted not just in India, but also in Singapore and Srilanka,” said J Sriram, Founder of the theatre group Chorus. Snippets from epics can be found in contemporary theatre. Chorus has been using the characters of Ramayana in their plays. The stories are modified to suit the modern world, retaining the historical relevance and mythological essence. “For example, one of our most acclaimed plays called Mara speaks of the hassles of King Raavan’s wife Mandodari and her unconditional love towards him. It is a piece from Ramayana that never came to limelight. We focus on such subjects that did not get enough attention in other art forms like cinema and storytelling,” said Sriram. Using mythology helps in characterisation and building relevance for the audience. Examples include Lord Hanuman narrating the epic of Ramayana to a thief, transforming him, and the characters of Ramayana pointing out the drastic effects of Internet addiction to the current generation. “By using notable characters from epics, we can save the time needed to build a new, unknown character on stage,” Sriram added. Every theatre group has a personalised style of adopting characters from the epics. Some change the plot and retain the characterisation, while others use the same plot with a touch of Kalari, yoga and dance forms. However, the common thread lies in focusing on the less-known characters from the epics. “Our play on Urmila, staged as ‘Solitude’, has no Rama. In simpler words, it is Ramayana without a lot of Rama. We establish facts from Ramayana and modify the internal monologue and feel,” said Yugesh Ramachandran, Script Writer for Crea-Shakthi. “At the end of the day, it is all about how a play resonates with society. It is interesting how mythology facilitates it, by echoing the voice of society,” said V Balakrishnan, Founder and Artistic Director at the group called Theatre Nisha. Another trend in Chennai’s theatre scene is the use of various performing arts to convey a story. An example is Kalakshetra’s performance of Shakespeare dramas through Kathakali. Modern takes on Shakespeare have fascinated the Chennai audience. Theatre Nisha’s play ‘The woman who killed the buffalo’ explains goddess Durga’s story through Kalari, yoga and contemporary forms. Theatre Nisha has also performed a play on Mata Hari, an alleged spy during World War I, through contemporary dance. Elephant in the room, a play by Yuki Ellis is a story of Ganesha that allows us to look at ourselves. It is a story of a young boy who has been given an elephant’s head — in other words, the story of Lord Ganesha. The play is presented through modern dance forms. Though mythology-based plays are not as trendy as musicals or other modern forms of theatre, they have a bright side in terms of audience numbers and the birth of amateur theatre groups. As the plays are relatable, there has been a slow but consistent rise in the number of people going for these plays. Two-way communication between actors and spectators is another fascinating factor. “Theatre is more liberal than cinema. Choreography in theatre is interactive and realistic, and you get to see the crudest form of acting here,” said Naren M V, a regular audience at theatre shows in Chennai. Theatre has become a hobby for many corporate employees and students as well. Just as corporate employees get together to play a cricket match, they also do so to put together a play. “More and more college students and corporates are getting into theatre for self-development. This is an important trend, as it drives all sections of people towards the art form in one way or the other,” said Bala. In a mythological play on Urmila by Crea-Shakthi, first time actors who were trained in workshops succeeded in impressing the audience. Mythology has always been a vital part of Tamil theatre, even before Na Muthuswamy’s era. Presented in a modified or original form, the crux of using mythology in theatre is to create an impact among the audience and pave way for societal transformation. Isn’t that the primary responsibility of any medium?